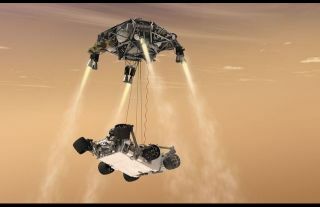 This artist's concept shows the sky-crane maneuver during the descent of NASA's Curiosity rover to the Martian surface, which engineers dubbed "seven minutes of terror." The Mars 2020 mission will leverage the design of this landing system and other aspects of Curiosity's Mars Science Laboratory architecture. MONROVIA, California — NASA's next nuclear-powered Mars rover, slated to launch in 2020, is slowly coming together. And while the Mars 2020 mission is largely based on NASA's Mars rover Curiosity, which is now exploring the Red Planet, there are a variety of distinctions that set it apart. NASA's Mars 2020 rover mission is expected to explore a select site that's geologically diverse, is likely to have been habitable and to seek out signs of past life. This month, a mix of rover specialists and landing-site scientists met here to discuss the ambitious Mars 2020 mission during NASA's second landing-site workshop for the flight. The meeting's primary goal was to pare down a large number of candidate landing sites on Mars that emerged from the first workshop. Future landing-site meetings will eventually pick the winning exploration zone. The meeting, which ran from Aug. 4 to Aug. 6, also served as a sort of show and tell time for engineers as they work ahead of key decisions that need to be made in designing the Mars 2020 robot. "These landing-site workshop meetings are scientifically the most exciting meetings. We get real discussion about whether or not somebody is just blowing smoke or not and what is real," Meyer said. "Getting humans out of low-Earth orbit with Mars as the ultimate destination … this mission feeds into that, and it's critical." This NASA artwork depicts the various instruments slated to be wheeled across the Red Planet on the Mars 2020 rover mission. The future Mars rover mission is billed as leveraging the successful architecture of NASA's Curiosity rover/Mars Science Laboratory mission, including its entry, descent and landing system and much of its rover platform. Curiosity landed on Mars in August 2012. To keep the development costs in line and to accommodate the new elements of the project, the management and engineering teams must make maximum use of subsystems that do not need to be changed, Lee told Space.com. "In a sense, then, there are two Mars 2020 projects operating at the same time," Lee said, "one that is trying to make certain that only changes that are absolutely essential are made in the heritage subsystems, and another that must implement the new elements following historical development practices." So what are the new elements of Mars 2020? You can count on a scientific payload that includes new remote-sensing and contact-science instruments, Lee said. Then there's the sampling and caching system that will extract cores from rocks and leave the Mars samples to be returned to Earth by a possible later mission, he added. Furthermore, "there's need for a more efficient surface-operations system that will enable the mission to assay, sample and cache at least 20 scientifically important samples in one Mars year," Lee said. In addition, all parts of the Mars 2020 project must be cognizant of the need for strict planetary protection and contamination control in all elements associated with the samples, he added. "The challenge to the Mars 2020 project management is to properly balance a resistance to change to the heritage subsystems with the open mindedness necessary to design and implement the new elements," Lee concluded. A comparative view of NASA's Curiosity rover and the future Mars 2020 rover in terms of performance on the Red Planet. Engineers at the meeting said that the Mars 2020 system is changing as its design is refined. For one, the overall system is becoming heavier. The rover's wheels are getting heavier, with the robot's body becoming a little longer. That may change the rover's mobility system and how it interacts with the ground, mission engineers said. "We are really looking at ways to make this largely heritage, built-to-print rover drive faster and do more science on the surface of Mars," said Jennifer Trosper, JPL's mission manager on Mars 2020 and also the surface-phase lead. One thing the Mars 2020 team is confronting right away is the issue of wheels. Curiosity has been battling wear and tear on its wheels, a surprising and nagging glitch. "Yes, we are going to have significantly more robust wheels," Trosper said. "That will not be the problem we have on Mars 2020." The wheel deal. Curiosity Mars rover is suffering from wheel wear, as seen in this image, taken August 16, 2015, Sol 1076. Designs are in the works for a new set of heftier wheels for the NASA Mars 2020 robot. "We can actually spend much less percentage of the mission traversing to interesting science sites and actually do contact science at those sites," Trosper said. "We are putting some things onboard the vehicle to make it smarter so we don't have to be so conservative on the ground … to make this surface mission more productive," Trosper said. Adopting these changes and other measures, she added, would make mission efficiency jump from Curiosity's roughly 55 percent to 80 percent, up to 95 percent for the Mars 2020 robot. During the landing-site meeting, engineers identified several "inescapable hazards" for the rover, such as sand drifts, high rock hazards and areas of high rock abundance, as well as slopes. "Rocks! Geologists love them … engineers hate them," said JPL's Matt Golombek, co-chair of the Mars Landing Site Steering Committee. Graphic depicting the current ranking of candidate sites for the Mars 2020 rover. Landing site specialists took part in a three-day workshop earlier this month to analyze and vote on pros and cons of each possible landing zone. While the final landing site that the Mars 2020 mission will target is still to be determined, a new technological add-on is under deliberation. The new rover may carry Terrain Relative Navigation technology, which could allow the consideration of landing sites that are more troublesome in terms of menacing terrain issues, such as large rocks or machine-killing slopes. "We only want to put it on if we need to put it on," said Al Chen, who is the entry, descent and landing-system lead at JPL. Terrain Relative Navigation, or TRN for short, would be enabled by just a few pieces of hardware, a computer and a camera, Chen told Space.com. According to Chen, the new TRN system works like this: During its descent to the surface, the Mars 2020 rover would take pictures of the terrain below and match them with an onboard map of the target landing site. "It helps the vehicle figure out where it is," Chen said. "Once [the rover] knows where it is, it can use a map of the nearby hazards to land in one of the safe spots. TRN makes the vehicle a little smarter about what's going on." In order to make it safer to land, TRN could allow so-called "diverts" during the rover's landing of nearly 2,000 feet (600 meters), he added. The computer processor that does the TRN job can also do double duty on the surface to speed up the 2020 rover's processing as the robot wheels across the Mars landscape, Chen said. "It's not about physically moving the rover faster when it's driving," Chen said. "It is about reducing the time that you are spending between drive steps, thinking about what you should be doing next." Chen said that TRN is considered a prerequisite technology for evolved human and precursor missions to Mars. The technology is ideal for not only hazard avoidance, but also to stick your landing next to prelanded hardware like habitats, food and other items. "You don't want to drive miles and miles away to get to those assets. You want to land near them … right where you want to be," Chen concluded. Leonard David has been reporting on the space industry for more than five decades. He is former director of research for the National Commission on Space and is co-author of Buzz Aldrin's 2013 book "Mission to Mars – My Vision for Space Exploration" published by National Geographic with a new updated paperback version released in May 2015. Follow us @Spacedotcom and on Facebook. Originally published on Space.com.